There are many words that can be used to describe the veteran baseball card blogger known as Dime Box Nick. Shrewd, for the deals that he manages to score in his thorough dime box digs. 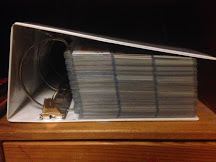 Patient, for the time he takes to comb through the hundreds of trading cards contained within said disheveled boxes. Kind, for the hearty packages that sends out to others, out of unprompted generosity. Thoughtful, for the meticulous care that he puts into the selection process for those aforementioned mailings, tailoring them to the specific wants and needs of each fellow collector. In short, Dime Box Nick is easily worthy of all of these descriptors. I was reminded of this over the weekend, when I discovered a thick, yellow, padded mailer in my mailbox on Friday afternoon. After dealing a long day of prepping the new computers for summer school, this was an exceptionally welcome sight. What better way is there to work through the stresses of a long day than by sorting through new baseball cards? Personally, I can't think of a better way. Long story short, I was, as always, completely blown away by what I found within generous Nick's unannounced gifting. It got me wondering, with as many adjectives as I could use to describe the sender, what descriptors could I gather from the dictionary and thesaurus to affix to the awesome cardboard he sent my way? Time to put the ol' puzzler on top of my neck to work! Circa '97 is easily one of the most psychedlic, non-Pacific baseball card sets to ever hit the market; so many squiggly lines, wildly contrasting colors, obnoxious foil, and WordArt-worthy text crammed into a 2.5" x 3.5" rectangle. 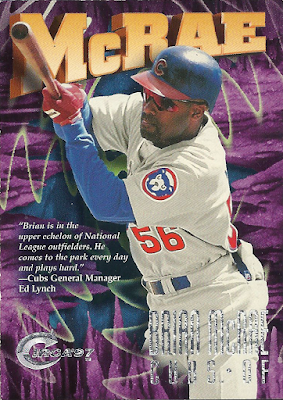 It's so gloriously 90's, I can't help but love this Brian McRae gem - it's easily the most purple Cubs card in my collection. 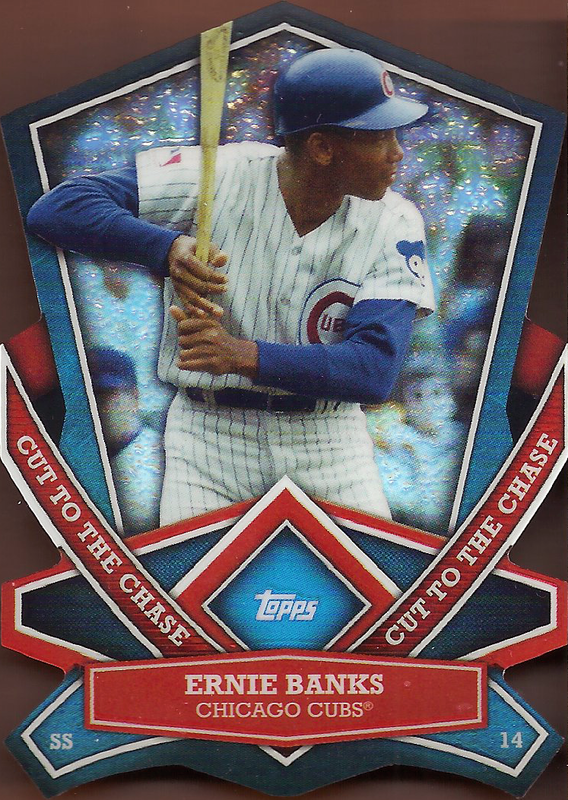 Not to be outdone, this much more recent Ernie Banks, Cut to the Chase insert from 2013 Topps is haphazardly die-cut in an incredibly wild way. So many edges and points... it's a nightmare for storage but a definite treat for the eyes. Stadium Club has traditionally been about the photographs and the the 2016 edition of the product was more than up to the task. 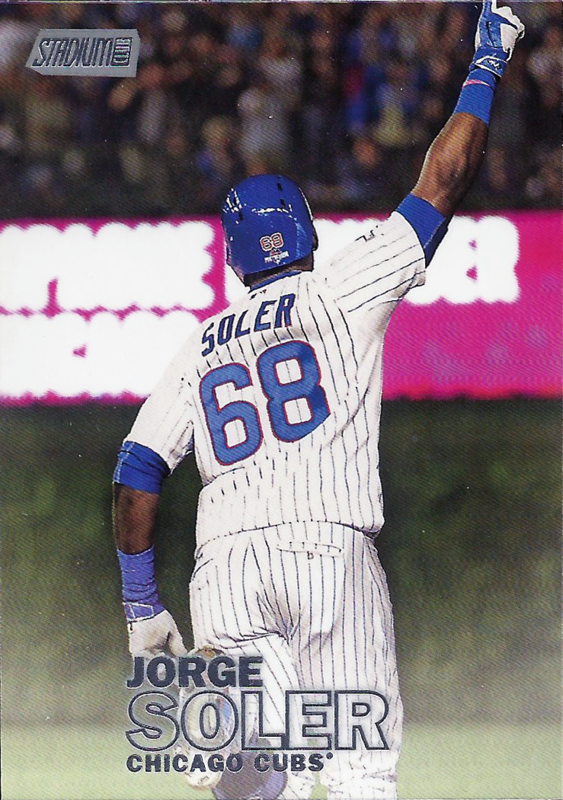 I don't think there's any other way to describe that image of Jorge Soler raising his fist in jubilation after smashing a home run into the Chicago night. Even better, I do believe this image is sourced from Jorge's big-fly against the Mets in the 2015 NLCS - one of the few bright spots in an otherwise dismal series. Nevertheless, it's a big moment on a big stage forever captured in my cardboard collection. 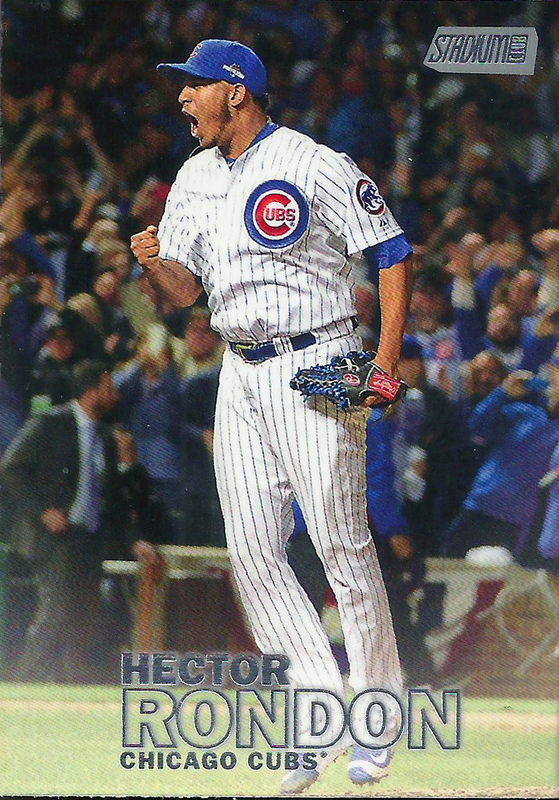 On that same note, we also see an elated Hector Rondon, overjoyed at the fact that he's locked down the series-clinching save in the 2015 NLDS - the first playoff-series win for the Cubs since 2003. This was an already epic moment further enhanced by the fact that the win came at the expense of the detested St. Louis Cardinals, in their first ever postseason match-up. Oddballs are always a key ingredient in whatever trade package Nick cooks up - this one was certainly no exception. 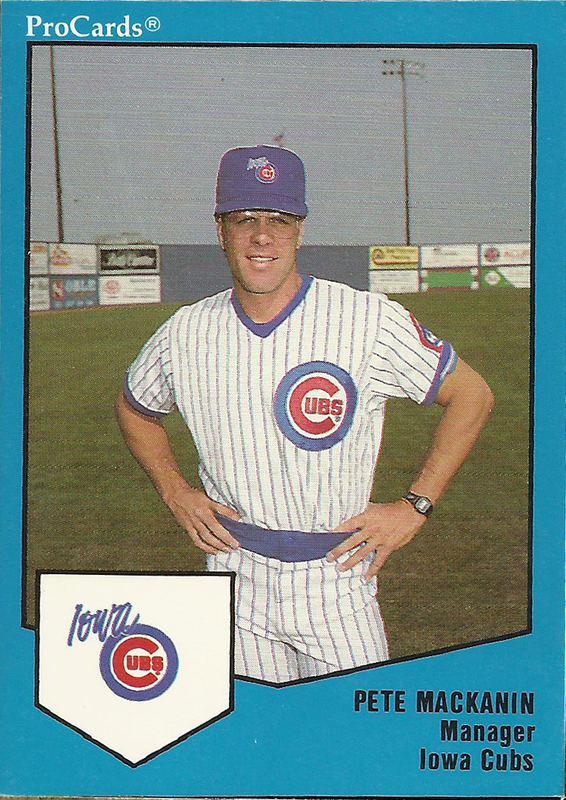 Did you know that longtime Major League player, coach and current Philadelphia Phillies manager, Pete Mackanin, had a Cubs connection? I did not until this 1989 ProCards single, commemorating his time as the manager of the AAA Iowa Cubs, fell out of the stack. Into my "Coulda Been a Cub" binder Pete will go. 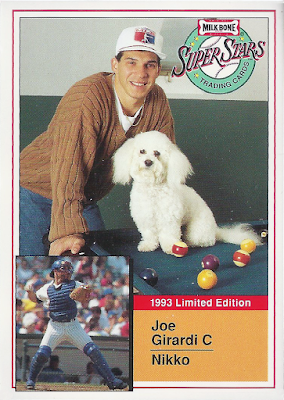 Meanwhile, how many baseball cards feature man's best friend? The junk wax era produced some off-the-wall retail sponsored sets and this Milkbone Super Stars collection was easily one of the most unique. I've long seen these "puppies" *ba dum tiss* pop up on the blogosphere and have coveted them all this time. Now, I finally have one of my own to take care of... and I don't even have to walk it or clean up after it! 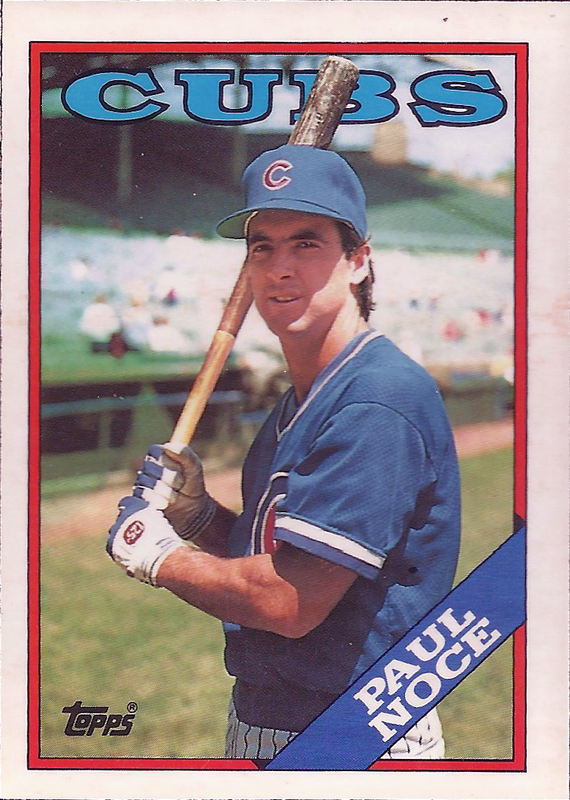 There are no if's, and's, or but's about it - I'm an unashamed sucker for anything shiny and lustrous baseball cards are no exception. 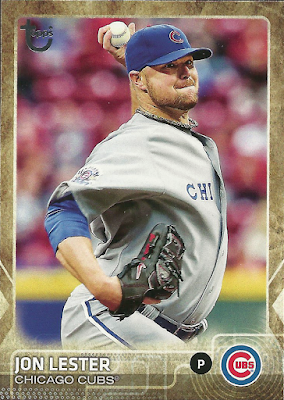 As such, I was "blinded" with happiness to see this chrome Bowman Hometown parallel of former Cubs All-Star (remember that? Seems like forever ago), Marlon Byrd included. 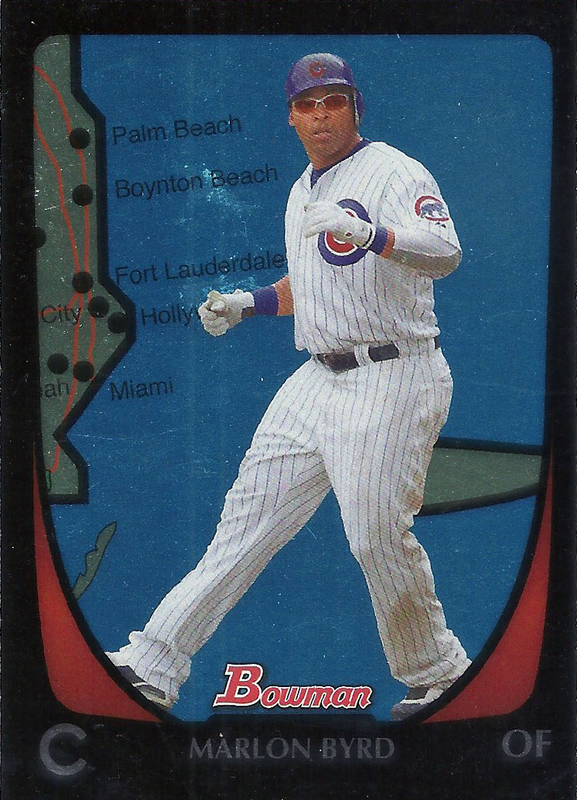 As an added bonus, now I will always remember that the well-traveled Major Leaguer originally called Boynton, Florida home. 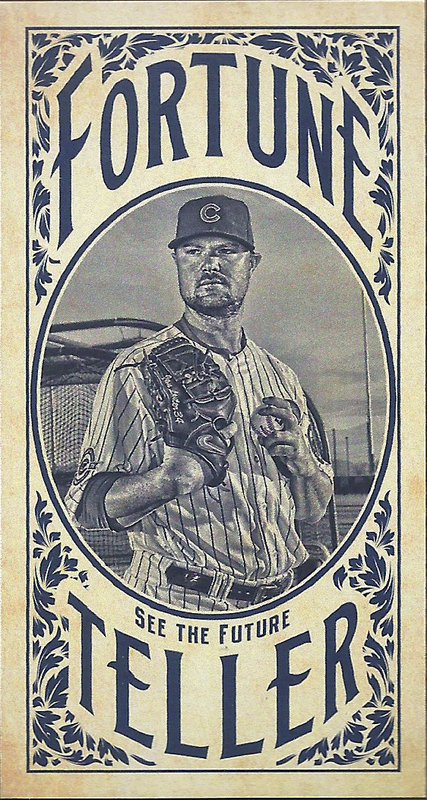 One of the best insert concepts in recent years has been "Pride & Perseverance" - a set which payed tribute to players who have overcome disabilities and other incredible hurdles to star in America's pastime. 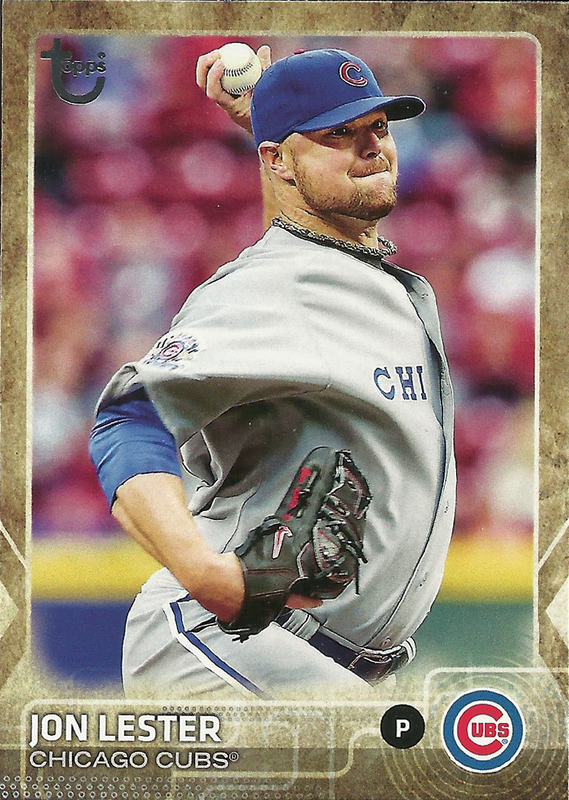 Jon Lester is honored in this checklist for his triumphant battle with cancer. I have to say, the men being honored here are, without a doubt, deserving of a gold border. As in, a spirited game of cards. This one is a bit of stretch, I know; nevertheless, I do feel quite "spirited" about their inclusion on Nick's mailer. Melding playing cards with baseball cards is one sure way to get my attention; after all, I've dedicated an entire post to the topic, as they are among my favorite varieties of oddball. These tributes to the original set of Topps baseball cards (1951) and the game card inserts found in 1968 Topps hail from Heritage and Archives, respectively, and both feature current Cubs hero, Anthony Rizzo. Another adjective that might be used to describe the card on the right is, as the kids say, "on point." 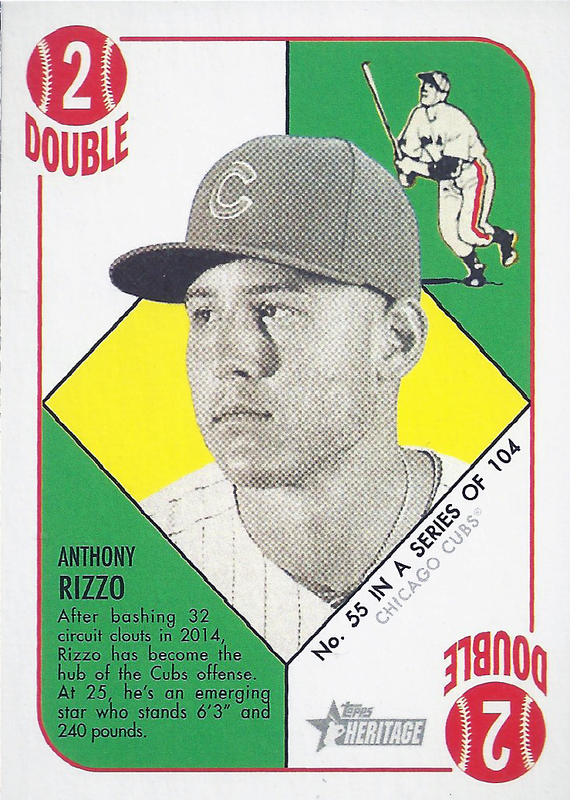 Someone at Topps was clearly paying attention when they affixed "hit by pitch" to the Rizz, in this instance, seeing as Anthony lead the league in said statistical category in 2015 (30) and is currently doing so again (12 thus far). 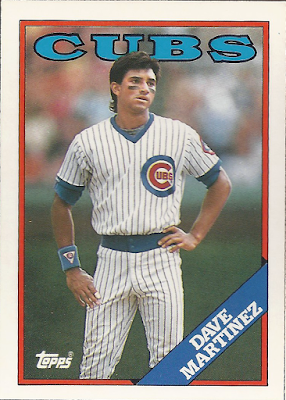 These might seem like ordinary, unassuming base cards from the junk wax staple that is 1988 Topps. 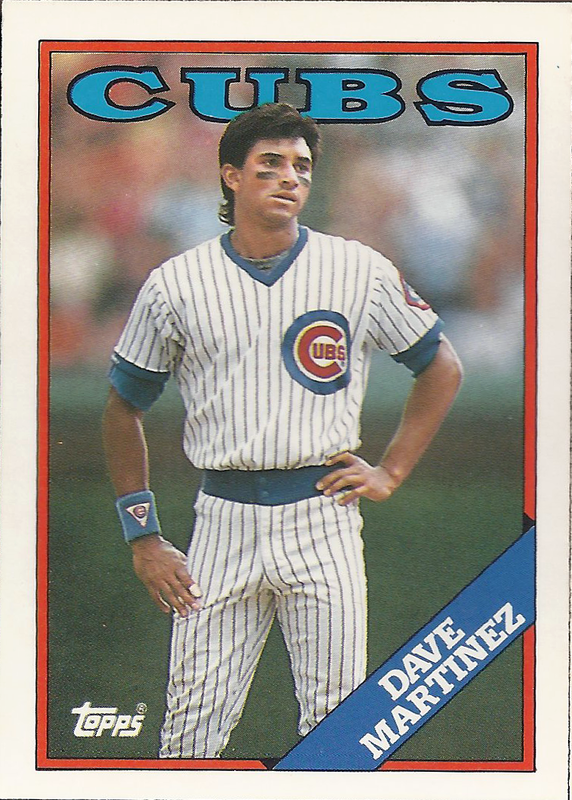 However, looks can be deceiving - Dave Martinez and Paul Noce are actually both examples of the set's higher class, twin brother, Topps Tiffany. It might seem almost precious now, but this is what was considered premium in the late 80's - high gloss. 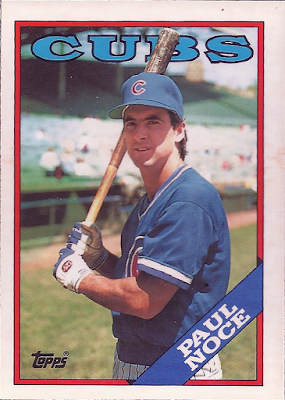 Accordingly, to this very day, the glossy parallel set is much more difficult to track down than it's underachieving brother and had been previously unrepresented in my binders. 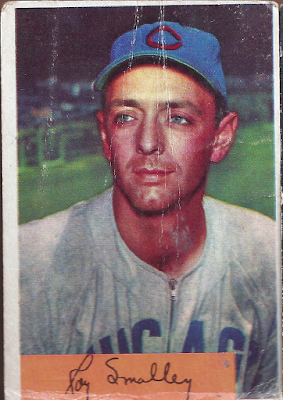 Courtesy of the ever classy Dime Box king, this egregious slight has now been rectified. Both of these cards pay tribute to the vast history of baseball, doing so in different, but still esteemed ways. 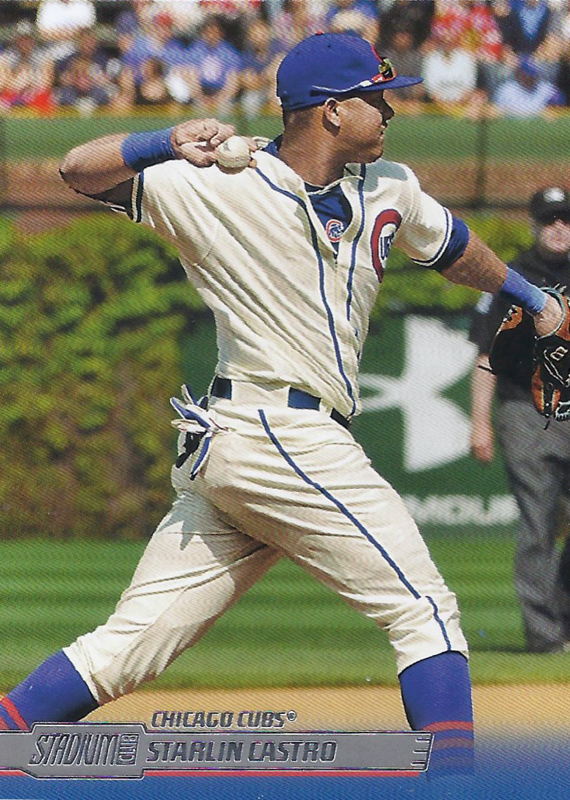 Current Yankee standout, Starlin Castro, is seen here sporting one of my favorite Cubs uniforms of all-time, a creme-colored look from the 1940's Just look at those striped socks and tell me that these duds aren't the cat's pajamas - if you say otherwise, you're lying to yourself. Combine this characteristic with the lush Wrigley ivy as a backdrop and you've got a wonderful homage to baseball history. 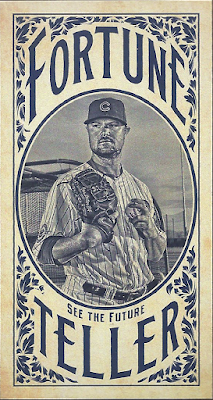 Meanwhile, Jon Lester pays tribute to cards of baseball past on this Fortune Teller insert from the most recent release of Gypsy Queen. The look of these cards and their odd dimension are reminiscent of the tobacco cards from the late 19th and early 20th centuries. 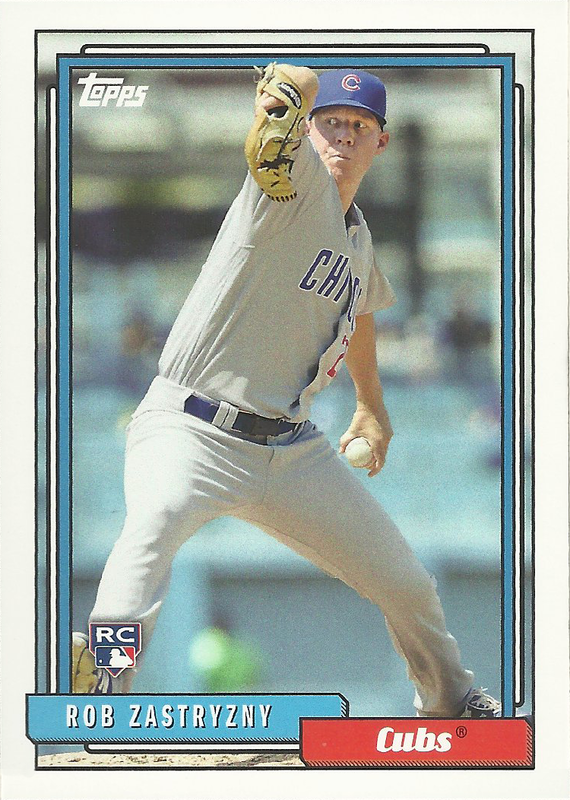 While the designs you see here are clearly aped from years long gone by, make no mistake, these hurlers both hail from the latest product to hit your local retailer's shelves - 2017 Topps Archives. The latest product is one that my LCS, Target, and Walmart have all been slow to unpack and stock; thus, these are my first samplings from the repetitive, retro-themed set. 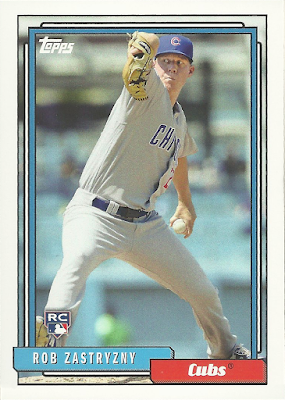 Rob Zastryzny seems to be the designated rookie in Topps products this year, appearing in Archives, Inception and Series Two, thus far. It makes sense, seeing as he appeared on the postseason roster (even if he never appeared in a game) and had himself a successful debut trial (1.12 ERA in 8 games, 1 start) last year. 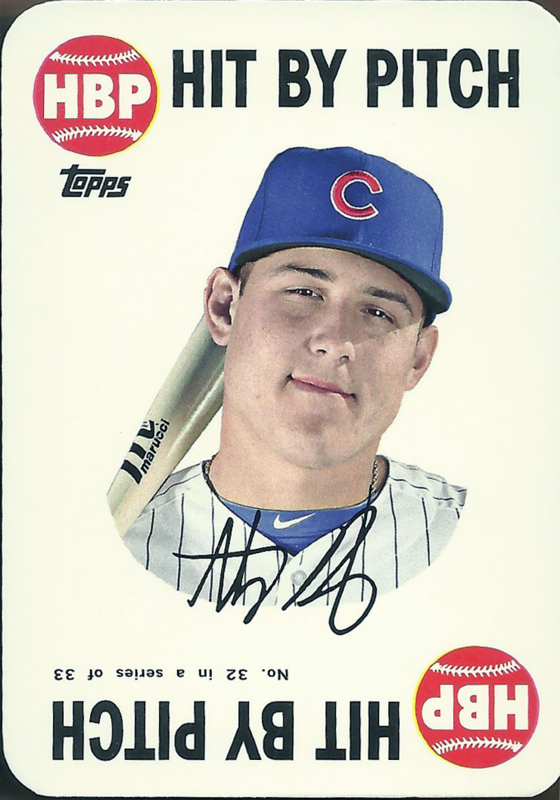 This makes up for lost time, seeing as Zas has never appeared in a Topps or Bowman product before and his only mainstream card with an airbrushed college uniform in 2013 Panini Prizm. As such, I can now replace that ugly, black eyesore with a bonafide Chicago Cubs card in my Cubs All-Time Roster Collection binder. Score! Ooooooooh boy - look at that vintage excellence! Perhaps "jaw-dropping" would have been more apropos? 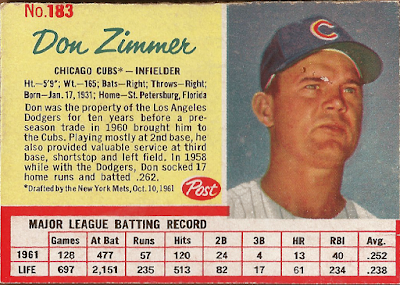 It would normally be extremely tough to top an authentic Post cereal card from the 1960's, especially one that features Chicago folk hero and baseball lifer, Don "Popeye" Zimmer; however, a beautiful 1954 Bowman the perfect one-upper! It may be creased and a little soft on the bottom, but it's still a vast improvement over the bland reprint which currently reps Roy Smalley in my CATRC binder and is one of the oldest cards I've ever received in a trade. This is really where Nick sealed the deal and made this mailing an all-time classic. 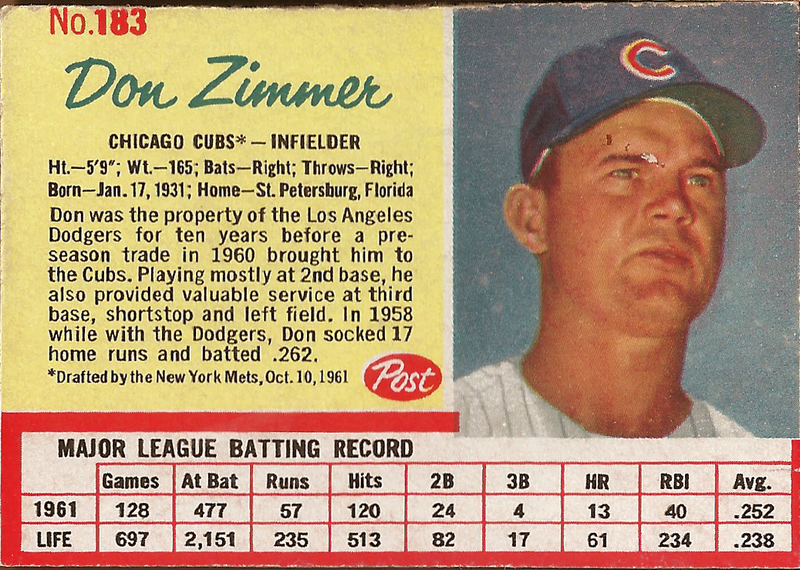 Also, for the record, the Post oddball also easily unseated Zim's previous representation in said binder, as well. Like I said, this trade package was certainly one for the ages and I'm simply running out of adequate adjectives to describe it's total perfection, Nick's generosity, and my giddiness. Seriously, my thesaurus' spine is starting to fail with how much I've been forced to flip though it. It's going to be tough trying to craft a proper thank you, but I assure you that I will do my damndest! Today, I declare Nick to be both the king of the dime boxes AND king of the adjectives. All hail. Dude. I spit my drink out at the Joe Girardi card. Ernie and a puppy?! It just does not get any better! Any post that references Schoolhouse Rock is an AWESOME post as far as I'm concerned, to unpack that adjective. Happy you needed a good portion of what I sent! 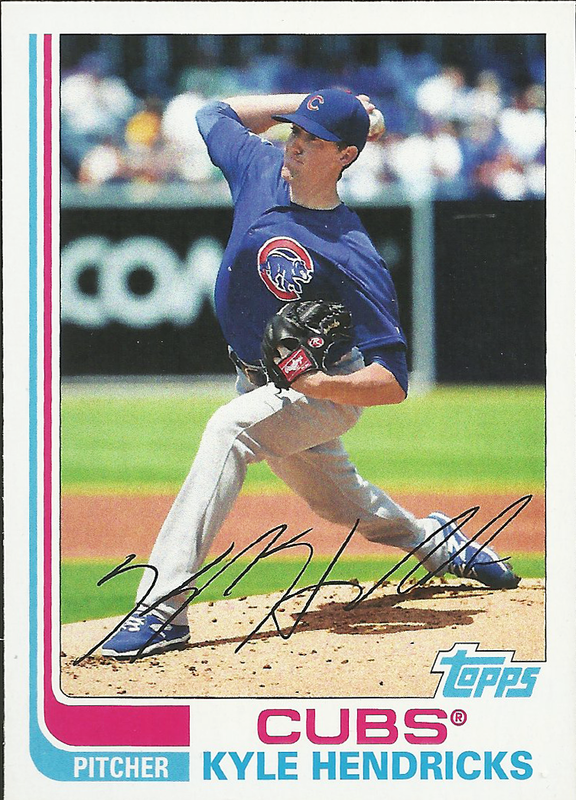 Just when I'd finally gotten the hang of spelling "Samardzija," Rob Zastryzny shows up and gives me a new mess of vowels and little-used consonants for me to misspell over and over again.